WASHINGTON, D.C. -- Americans' confidence in the U.S. economy last week is about even with what it was the previous week. 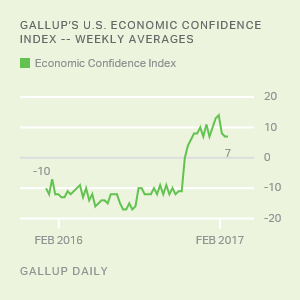 Gallup's U.S. Economic Confidence Index averaged +9 for the week ending Feb. 26. The latest weekly average is two points higher than the prior week's +7 index reading, though not as high as scores averaging +10 to +14 through most of January. 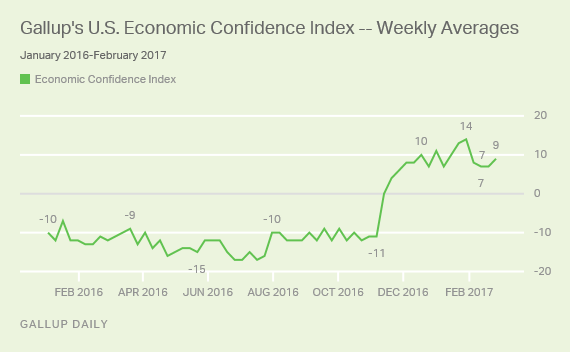 President Donald Trump's inauguration in late January coincided with the index's reaching highs not seen before in Gallup's nine years of tracking economic confidence. The index has retreated slightly in February but remains higher than all but a few readings Gallup has tracked since 2008. The Economic Confidence Index has been in positive territory for 15 consecutive weeks. Americans remain just as upbeat as they were in late January about current economic conditions, but they are now less optimistic about the economy's future. The current conditions score for the week ending Feb. 26 was +14, about where it has been since late January. The latest score is based on 35% of Americans rating the economy as "excellent" or "good," and 21% rating it as "poor." Last week's economic outlook score was +4, up slightly from the prior week's +1, though still well below the +13 scores in each of the last two weeks of January. The latest score is based on 48% of Americans saying economic conditions in the country are "getting better" and 44% saying they are "getting worse." Americans are a little less upbeat about the economy than they were in January. 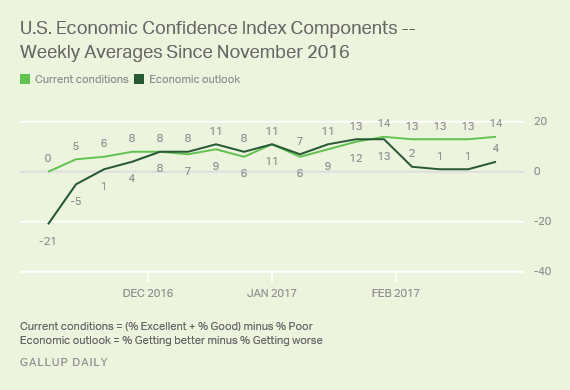 Overall, however, Trump's election has noticeably affected Americans' confidence, with improvements in both of Gallup's economic confidence indicators as opposed to a year ago. This shift is buoyed by a massive surge in Republican confidence and a sharp decline in that of Democrats. More than five weeks into Trump's term and almost four months since his election, Americans have greater faith in the U.S. economy than during most of the Barack Obama years. It is still early in his presidency, however, and this optimism could hold steady or fade as the president's economic policies are unveiled. Results for this Gallup poll are based on telephone interviews conducted Feb. 20-26, 2017, on the Gallup U.S. Daily survey, with a random sample of 3,543 adults, aged 18 and older, living in all 50 U.S. states and the District of Columbia. For results based on the total sample of national adults, the margin of sampling error is ±2 percentage points at the 95% confidence level. All reported margins of sampling error include computed design effects for weighting. President Trump's 40% job approval is 21 points lower than the average for presidents near the one-month mark and 11 points behind any other president's.